Thanks to top ratings for crash protection, a superior-rated front crash prevention system and good-rated headlights, the redesigned Subaru Impreza walked away with the Insurance Institute for Highway Safety's (IIHS) 2017 TOP SAFETY PICK+ award. Vehicles can win the TOP SAFETY PICK award by earning good ratings in the IIHS five crashworthiness tests -- small overlap front, moderate overlap front, side, roof strength, and head restraints -- along with an available front crash prevention system that earns an advanced or superior rating. The plus is added for winners that also have acceptable or good headlights. Both the sedan and wagon version of the small earned the + award. The Impreza's optional EyeSight system got a superior rating for front crash prevention. 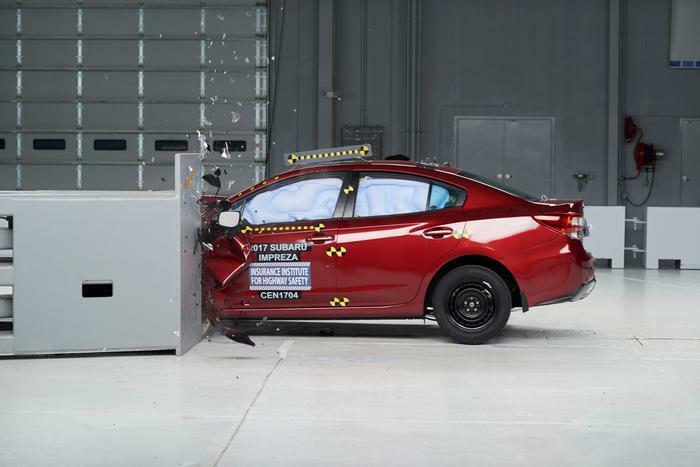 In IIHS track tests at 12 mph and 25 mph, the Impreza avoided a collision. The system also has a forward collision warning component that meets National Highway Traffic Safety Administration criteria. Several headlight systems are available on the Impreza. When equipped with LED headlights and high-beam assist, which automatically switches between high beams and low beams depending on the presence of other vehicles, the car earns a good headlight rating. Without high-beam assist, the LED headlights get an acceptable rating. The halogen lights that come on lower trim levels earn a marginal rating. The Impreza also earned the top rating of good+ for ease of use of LATCH hardware for installing child restraints, making it the only small car to earn top ratings in all IIHS evaluations.